At The Law Offices of Derek Lim in Fremont, California, we have been advocating for personal injury victims and for immigrants for over 20 years. During this time, we have helped thousands of immigrants and nonimmigrants, not just in Fremont, but also in San Francisco, San Jose and across the United States. The fact that we speak Chinese, Thai and Lao as well as English makes us particularly valuable to the East Bay Area's Asian immigrant population. Our law firm's clients have included people from China, India, Afghanistan, Thailand, Vietnam, the Philippines, Mexico, Burma, Nepal, Indonesia, Germany, the U.K. and France. 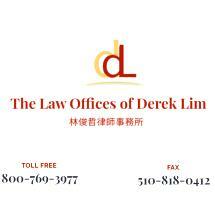 The Law Offices of Derek Lim stands ready to help with whatever immigration and personal injury issues our clients face. From our initial meeting to the successful resolution of their case, our only focus is obtaining each client's goal. We have a thorough understanding of EB-5, E-1 and E-2, and L-1 visas, as well as a thorough understanding of personal injury law and what it takes to obtain the maximum compensation possible. We pride ourselves on listening to our clients' stories, getting to know them personally, understanding their issues and concerns, and educating them as to their options so they can make the best decisions for themselves, their families and their businesses. We also respect their financial situations. Our work is efficient and cost-effective, and we accept all major credit cards for the payment of fees.